This blog post reflects the ideas of three kinds of people... People who survive on street style, those who cannot breath without brands on their clothes and those loving both. I would come in the category which loves both. Since Delhi is a state of having amazing street clothes people prefer buying cheap clothes which are comfy. Obviously fashion cant always promise to be comfortable. In Delhi, you can find markets full of street clothes and accessories. As a matter of fact, there's one just five minutes away from my house. The good thing about having such markets everywhere is that people don't have to go looking for them far away. The stuff available can surprise you a number of times. I once ended up finding pants which were like the pants worn by Aladdin. You can always find such markets crowded. Believe me, there's no space to even breath but then coming here is worth it. Like in America there are thrift stores, garage sales etc. 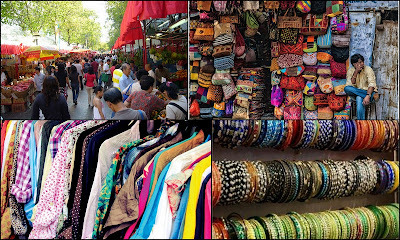 India has street markets, flea markets etc. Street markets are a good investment according to me. Who doesn't love brands? 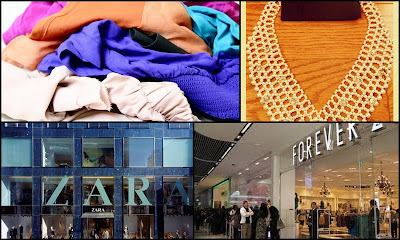 A teenager will always have at least one Zara or one F21 t-shirt in their closet. And nothing is wrong with that. These brands are good brands. They come in reasonable prices and are quite fashionable. In most of my outfit posts, there are things I've bought from F21 and Zara only. For amazing heels, I approach Nine West or Aldo. These shops sometimes do go over the top with the prices but then who doesn't need heels? So later on prices don't really matter to me. Brands have good cloth quality, they've got style and they are easily accessible. I prefer buying accessories from street shops because buying them from branded shops makes me feel I'm simply wasting the money. Of course headbands is an exception. I love finding great jewelry from stands! India is definitely one of those places I'm dying to visit!